The Zachman Framework is a fundamental structure for Enterprise Architecture rather than a methodology. It is probably the historic starting place for people interested in enterprise architecture. The framework is named after its creator John Zachman, who first developed the concept in the 1980s at IBM. 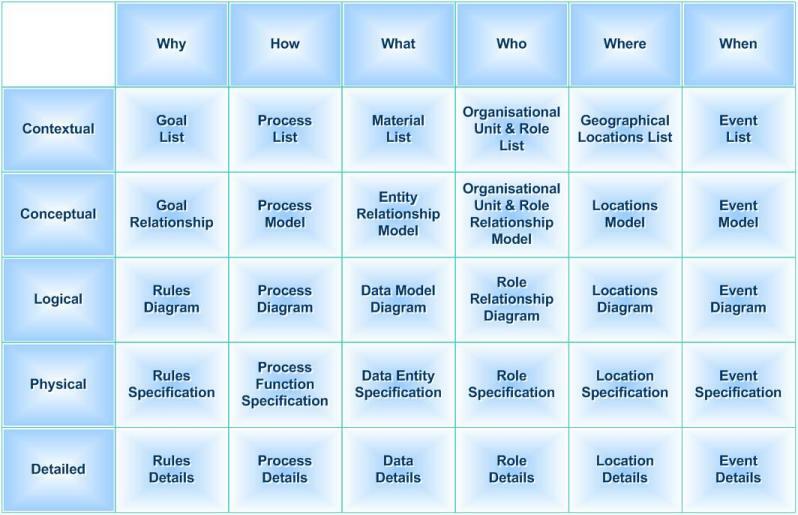 The basic idea behind the Zachman Framework is that the same item can be described for different purposes in different ways, and for this it provides a 6x6 matrix of categories. Zachman believes that each element is explicitly distinguishable from all the other elements, so that the matrix cells are not merely successive levels of increasing detail but are different representations. Each row represents a total view of the solution from a particular perspective. The columns are fundamental aspects or questions ("primitive interrogatives"): who, what, when, where, why and how.